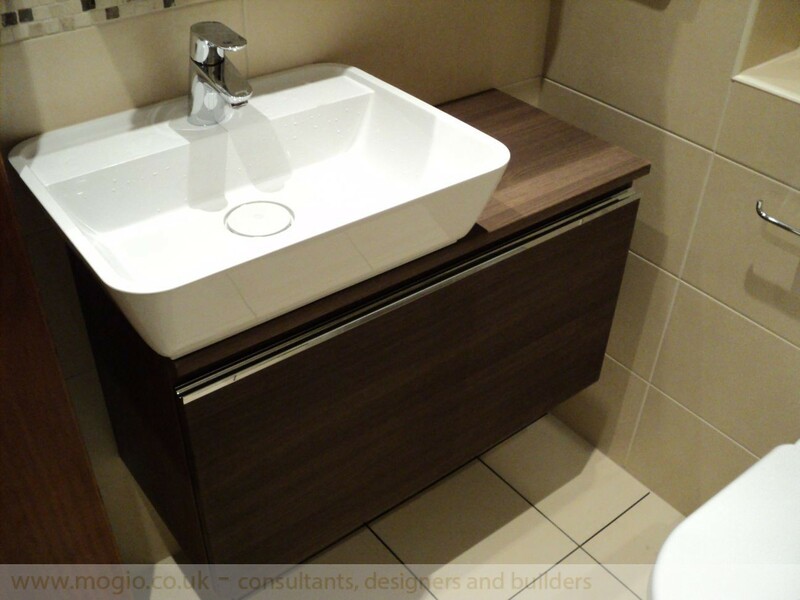 In relatively small bathrooms creating space and even a whole new look can often be done with minimal changes.The trick is to basically decide on a centrepiece in your bathroom, for example to choose modern bathroom furniture – cupboard with basin. Of course, you can always gut your bathroom and make a revolution by changing everything starting from floor to wall tiles. But for those who prefer small variations in the bathroom, Mogio presents supremely stylish and practical cupboard with countertop white basin. Wall hung for easy floor cleaning, cupboard bathroom furniture features a snow white ceramic basin inset into a roomy drawer unit. The stylised cupboard that Mogio proposed for a Client is done in Wenge finish. 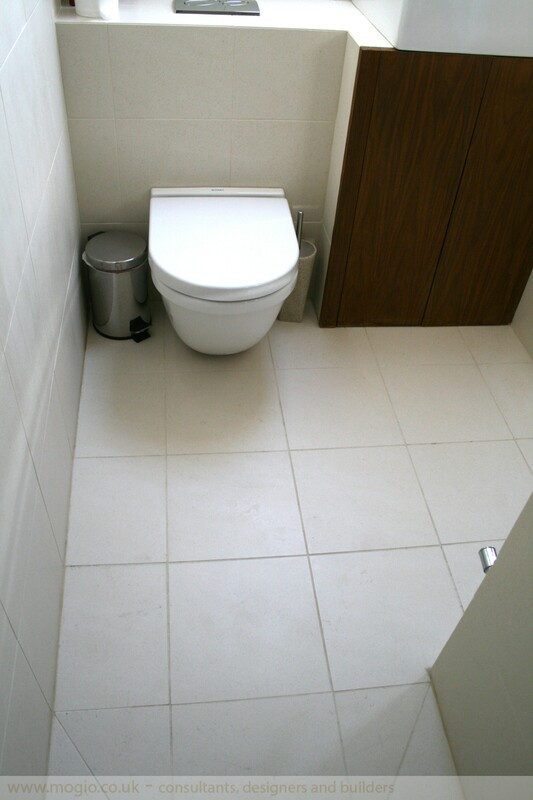 Dark colour of the furniture underlines bright wall and floor tiles. There is also an extra space on the right side of the basin. Traditional bathroom tap completes stylish cupboard look.The smooth generous curves give the tap real elegance. Modern and simple large mirror hanging on the wall above the cupboard makes bathroom more spacy. It opens outside. Inside the mirror there is additional place for bathroom gadgets like cosmetics and other accessories. With bathroom furniture, your options are endless. If you don’t want to make global changes in your bathroom, ask Mogio specialists how to better the bathroom within minimum efforts. Our designers will present you the best solutions to come up to your expectations and needs. 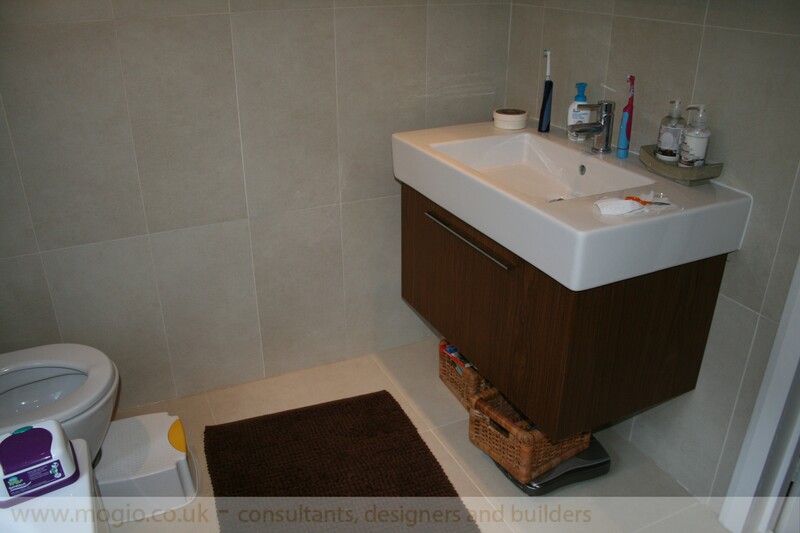 And what about your ideas on creating extra space in your bathroom?